Oxford researchers say that 45% of America’s occupations will be automated within the next 20 years; how will students stand out from this technology-driven world? Oxford researchers say that 45% of America’s occupations will be automated within the next 20 years. With numbers like that, students need to get as much real life experience to prepare them for the workplace. It is important students are prepared to challenge today’s technology instead of depend on it so much. 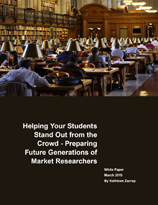 In this white paper, we discuss some of the bigger issues facing marketing academics and offer some tools and advice to help ease the transition of students into an exciting, but sometimes overwhelming, environment.